The Palstar R30A Shortwave Receiver is a premium shortwave receiver. There is no performance sacrifice for simplicity’s sake, because the R30A has outstanding strong signal handling, high sensitivity, and large dynamic range to eliminate annoying intermodulation interference. Two world famous Collins IF filters provide unmatched selectivity. The radio also features 100 programmable memories, variable rate tuning and switchable bandwidths in all modes. All of that is great, but the thing most people comment on when first hearing an R30A play, is its unmatched audio quality, especially when using a high quality speaker such as our SP-30. The R30A has a full 5 Watts of audio power to drive large external speakers. 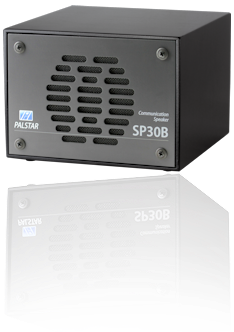 SPECIAL OFFER: When ordering a R30A from Palstar you will receive a free SP30B communications speaker (Regular Price: $99.95), 3.5mm to 3.5mm cable, and 1/4in Plug to 3.5mm Jack Adapter to use your SP30B right out of the box. You can also upgrade to the SP30H speaker for $100 (Regular Price: $199.95). With this pairing of Palstar designed products you will experience the ultimate in shortwave radio communication. Call to take advantage of this offer anytime before or after you place your order with Palstar factory-direct. The R30A HF shortwave receiver is a compact, high performance radio capable of receiving AM, CW and SSB signals in the 100KHz to 30 MHz spectrum. Unlike most general coverage SW receivers, the R30 is not desensitized on the LF and MW bands, making it ideal for Standard Broadcast Band DXing. All of this is squeezed into a footprint that fits inside a sheet of paper. The R30A receiver is also equipped with a 10 AA cell internal battery pack that automatically connects to the radio when the external adapter plug is disconnected, allowing portable operation.